Some progress was made on the weekend. 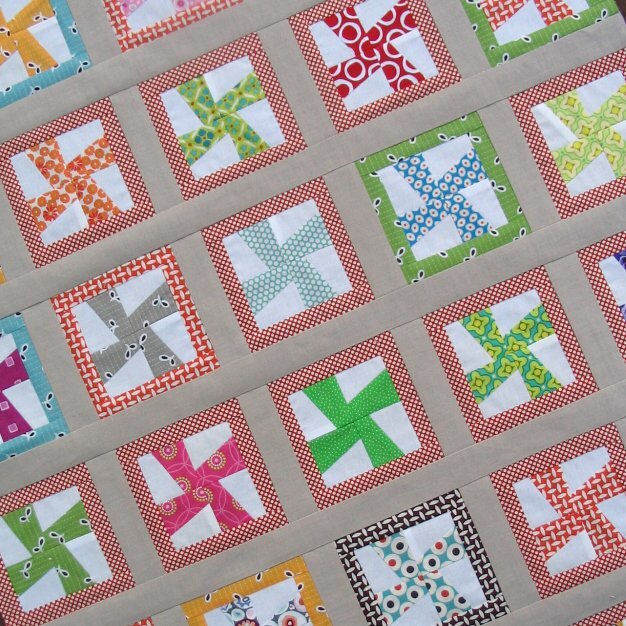 This lot of pinwheel blocks was turned into this baby quilt top. The sashing fabric I used is again some favorite linen/cotton blend fabric, this time in Hessian colorway. (The same fabric I used for the Aqua/Red Triangle Quilt). I am going to add some borders today, start the backing, and maybe even start the quilting. Thank you also to everyone who left comments on yesterday's post asking for online fabric stores that sell cute Japanese prints. I think I am going to make a handy reference list of all the links and add them to the sidebar of my blog. I love some of the Etsy stores selling these prints, I know I will be loading my cart soon! Just beautiful. The linen sashing makes it look so fresh. Progress indeed! Beautiful Rita! 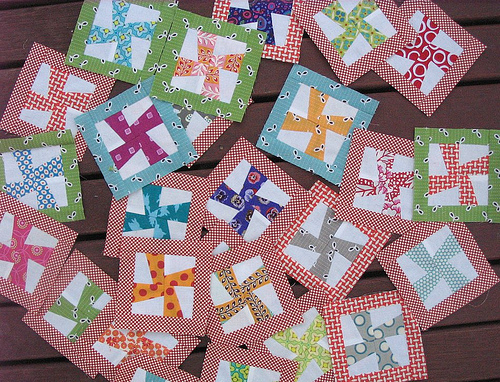 Does seeing these pinwheels in a cot size quilt tempt you to make a larger one? I think the linen really sets off the colours. That is so beautiful! I do love the borders around each square, they really frame each piece so nicely. Tempts me to make a wall hanging quilt one day. This is so beautiful! Love the pinwheels against the linen sashing! Stunning ... again! I have those little pinwheels in my BOM quilt - mine are so tiny - how big are these, please? This quilt is so gorgeous! I absolutely love it. I haven't ever made pinwheels - need to give it a try. The way you framed each one is so cute! I love the ending. Linen is just so nice. Some progess...some progress in my house is moving the fabric pile from the middle of the dining table, back into a box where it belongs! I really want to start a quilt but I know I am not going to be happy with my fabrics, but that's what you get for living in NZ with no decent fabric shops. Maybe I need to open my own! I love the pinwheels and, again, your use of gray! The pinwheels are so cute. Before they were put into the top I thought they would make cute coasters. It keeps getting better!! :-) Yummy! I love this quilt & would love to try it one day . I agree about the colours & linen being such a great pairing. I love this... I know this might be silly but what pattern did you use for these? How big are they? I have been wanting to do something like this - small and cute. Great info on where to go to find the japanese prints. Your mini framed pinwheel is another winner! How wonderful this turned out. Love those little blocks and the sashing just sets it off. Great work. Beautiful quilt. And I have so fallen in love lately with the use of linen with traditional quilting fabrics. I love the combination of the elegance of the simplicity of the design, the richness of the linen and the bright happy pinwheels. What a stellar quilt! Some progress??? Are sure you don't have a secret stash of elves working for you? You're a machine woman! I just love this--what a fresh approach to the pinwheel block. I for one, would be heartily appreciative of a Red Pepper Quilts Handy Reference List. Lovely colours - but I think I say that EVERY time I pop by! Love the cute pinwheels! They really pop with the linen sashing - adorable! looking at all of your pictures is bad for my health!! it's hard to get anything done when you keep giving me new ideas! Really adorable! I love the linen sashing. This is so, so cute! I love it. I love the linen sashing. Well done! I agree with Tam @ 1/4 of an Inch! You are a machine! WOw - this is a beautiful quilt. I love those mini pinwheels and the little frames around them. Beautiful setting too with the linen sashing. Thanks for the inspiration! I love how this quilt looks. In the past I have seen this “pin wheel” block many times on various blogs but this is the first time I have seen it boxed in and then sashing added. You have a good eye and much talent for quilt making.